"Lisa, I&apos;m almost there," I said into the phone. The airplane had to be going as slow as possible. "It&apos;s gonna be okay," she responded. "I&apos;ll call you when I get there," I told Dylan&apos;s mom. I couldn&apos;t cry on the phone. I don&apos;t want to freak her out. I stood up in the small plane and walked to the cockpit. The flight attendants were standing there talking and laughing. How could they be laughing? Dylan was in an accident! "Excuse me," I said doing my best not to be rude. "but could you tell the pilot to go as fast as he can? My fiancé was in an accident and I really need to see him." The tears started to trickle slowly down my cheeks. "Of course," the older looking one said. I know she can&apos;t do much but I&apos;m glad she&apos;s trying, even if it is just for me to feel better. Ki Hong told me it wasn&apos;t that serious. He said the car just ran him over and that he had a couple broken bones and not to worry but I can&apos;t help it. I know Dylan and I know he wouldn&apos;t want me to freak out about it but I hopped on the plane as fast as I could and started heading to Vancouver. I called Ki Hong back as soon as we took off and told him I was coming. I can&apos;t seem to keep still. I keep fidgeting in this uncomfortable, hard chair and my mind keeps flashing pictures in my head of what my subconscious thinks it would look like if he was run over. I cringe at the sight and lay my head back in my seat to try to relax. Did he cry when it happened? 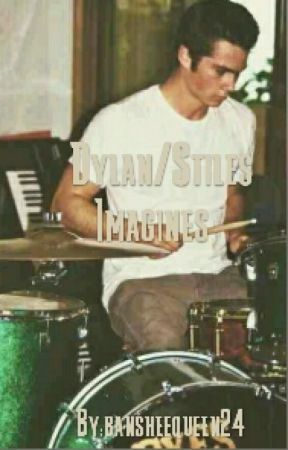 Knowing Dylan, I know he didn&apos;t cry. He probably tried to stand and when the driver of the car, if there even was one, tried to apologize, Dylan assured him that he was okay. When he couldn&apos;t stand up I&apos;m sure everyone freaked out. Could he even stand up? What bones are broken? I cringed again at my lack of knowledge on the accident and asked the flight attendant for some medicine to help my throbbing head. When we finally arrived in the hospital parking lot, I ran faster than I ever have before. "Dylan," I tell the girl at the front desk. "I need to see Dylan O&apos;Brien right now." She rested her chin in her hand and looked up at me. "And how do I know you&apos;re not just one of his crazed fans?" She asks. "I&apos;m his fiancé" I scream at her pointing to the diamond ring on my left ring finger. She laughs. "Yeah, nice try." She says and looks back at her computer. "Listen lady," I start. "I&apos;m sure you&apos;re a very nice person but I really don&apos;t like your attitude! My fiancé is in here somewhere and if you don&apos;t tell me where he is I&apos;m gon-"
"Y/N!" I hear Ki Hong scream. The lady at the desk looks up in shock that he knows me. He walks up to give me a hug and I smile at the lady sitting behind the computer. He drags me over to the chairs where James, Kaya and Thomas are sitting. "He&apos;ll be really glad you&apos;re here," Kaya says taking my hand after they all have given me a hug. "He&apos;ll be okay," James says. I shake my head and sit in between Thomas and Ki Hong. "How&apos;s your wife?" I begin to ask Ki Hong as a doctor walks out of a room heading towards us. That has to be Dylan&apos;s room. "He&apos;s recovering now," the doctor says. "Feel free to go in and visit. It wasn&apos;t too bad," he tries to joke and everyone laughs but me. I walk straight to the room and swing the door open. "Y/N!" Dylan screams. He tries to sit up but fails. Too soon. Tears stream down my cheeks at the sight of him. I ran and laid on his bed with him, wrapping my arms around his neck him wrapping his arms around my waist. "Why are you crying?" We both asked laughing. "I&apos;m just so glad you&apos;re okay," I tell him holding his smiling face in my hands. "What about you?" I ask. "I&apos;m just so glad to see you," he says smiling so it meets his eyes. "I love you," he tells me softly pressing his lips against mine. Is this too real? Too soon? Is this bad? I kinda like it. Comment and let me know what you think. Love you guys! Thanks for reading!